The Met Gala is a major annual event in the fashion world. This year's theme has made it a big night for HBO-inspired memes as well. The theme is "Heavenly Bodies: Fashion and the Catholic Imagination." It's produced surprising and spectacular results, and it has everyone making the same joke. If you spent any time on social media Monday night, you were in danger of being swept away in a deluge of Young Pope jokes. The celebrities entering the Met Gala looked like The Young Pope cosplayers, twisting the outfits of Jude Law's Pope Pius XIII aka Lenny Belardo. Some of the outfits even look like they were intentionally cribbing of the Belardo's style. This was lost on no one. 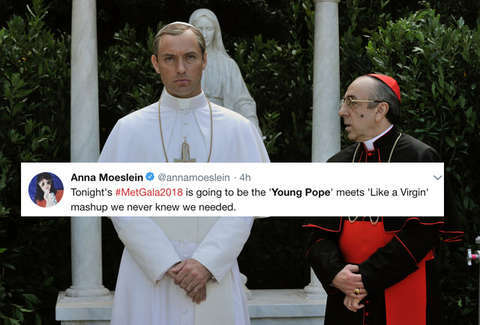 Here are some of the best jokes and observations about the Met Gala aka the teaser trailer for The Young Pope Season 2. Can we just call the #metgala what it clearly is, which is YOUNG POPE COSPLAY. Somehow, Law wasn't at the Gala. The only way this could have been improved was if he showed up in an actual costume from the show. The Young Pope was the perfect meme for the 2018 Met Gala unless you were trying to figure out what's going on with Tom Brady.